UNITED NATIONS, Jun 25 2018 (IPS) - A global campaign to end a longstanding health and environmental hazard– the use of mercury in dentistry—is steadily moving to a successful conclusion. “Europe takes that exciting step on July 1. Asian nations like Bangladesh and Vietnam are taking the same bold step this year. Several African nations may follow the lead of Mauritius (which ended amalgam for children in 2014). And Latin American nations such as Uruguay are well-prepared to do the same,” said Brown, a former Governor of the US state of Ohio. One of the highlights of the global campaign was an international workshop last month in the Thai capital of Bangkok. Amalgam has been defined as an alloy that consists chiefly of silver mixed with mercury and variable amounts of other metals and used as a dental filling. Western corporate interests, he pointed out, still try to hoodwink governments by peddling separators, to which is there is defiant opposition. “Money must be wisely spent on bringing in supplies of alternatives, changing dental school curriculum, providing information to parents and consumers, and focusing government programs and insurance on alternatives,” he noted. 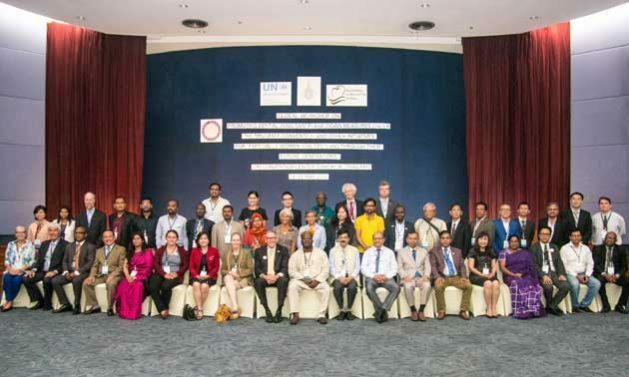 The Bangkok workshop was co-sponsored by the Nairobi-based UN Environment (UNE) and the World Alliance for Mercury-Free Dentistry. And the focus was on amalgam reduction especially to protect “women, children, and through them, future generations” – language from the Minamata Convention on Mercury. The Minamata Convention, described as the first new environmental agreement in over a decade – entered into force on August 16, 2017. The primary aim of the Convention is “to protect human health and the environment” from mercury releases, according to the United Nations. So far, the international treaty has been signed by 128 of the 193 UN member states and ratified by 92 countries, described as “state parties”, which are now legally obliged to comply with its provisions. The Minamata Convention joins three other UN conventions seeking to reduce impacts from chemicals and waste – the Basel Convention (1992), Rotterdam Convention (2004) and Stockholm Convention (2004). Dr. Shahriar Hossain of the Asian Center for Environmental Health told IPS that from every continent, there is intense interest in greatly reducing dental amalgam use. Dr Hossain said civil society increasingly speaks with one voice in favor of mercury-free dentistry, especially for children. The Abuja Declaration for Mercury-Free Dentistry for Africa (2014) was followed by similar declarations for other continents: the Dhaka Declaration for Asia (2015), the Berlin Declaration for Europe (2017) and the Chicago Declaration for America (2018). Assuredly, African governments, African dentists, and African parents want amalgam ended now for both for today’s children and for future children via toxic-free young women, he noted. Bally said children of the African region deserve mercury-free dentistry in their mouths and mercury-free fish in their food equally so to the children of Europe and wherever mercury-free dentistry is implemented. Asked about the next step forward, Brown said that in 2012-13, the African region led the Minamata Convention to a strong anti-amalgam plank. In 2018, Africans are ready to lead the Minamata Convention to the phase out of amalgam on a timetable. “Africans famously leapfrog to new technologies. Amalgam is a primitive pollutant of the 19th century imported to Africa from the West. But 21st-century dentistry is mercury-free dentistry,” Brown noted. He said the World Alliance for Mercury-Free Dentistry expresses its deep appreciation to the Honorable Erik Solheim, Executive Director of UN Environment, for encouraging this workshop and for providing the opening address, and to Nina Cromnier of the Minamata Convention Bureau for helping to guide it. “We note that Mr. Solheim, as Environmental Minister of Norway a decade back, was the first minister in the world to ban amalgam for a nation,” he declared.